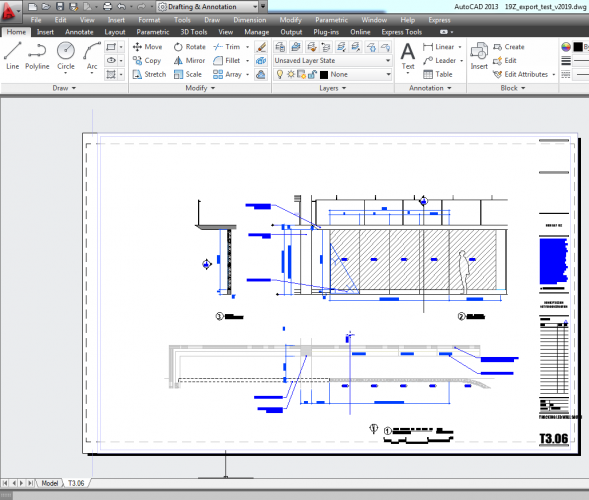 We are working with another design firm on a project, and eventually need to hand off DWGs that they can use. Internally, we're employing a BIM workflow: 3D model of the project, viewports for plans and section viewports for interiors and sections. Ultimately we want to be able to export drawings (plans, sections, and interiors in sheet-layer viewports populated by design layer geometry) as DWG model-space entities (design layers) that are annotated and cropped on DWG sheet layers (paper space). Unfortunately, when we do a test DWG export of one of our sheet layers and re-import it back into a blank Vectorworks file, we get sheet layer viewports of plans (good), but scaled symbols in lieu of section viewports that are not even properly cropped (not so good). Is it possible to achieve what we want? Is this a matter of settings, or am I asking the impossible? - if the clipped DWG block is from a Paper space, like in your case, it will need to be created in a VW Sheet layer, and then it will be imported as a non-cropped symbol. There is no way to import it as a clipped DLVP there. So it is not a matter of a setting. —I created a sheet layer with three viewports: a top/plan viewport, a section viewport, and a "back" viewport. —For the sake of the "back" viewport I created a distinct design layer for a single section. There I created section viewport, populating it with the design layers where the model geometry occurs (source design layers), like an old school layer link. Other than this design layer section viewport, this design layer is empty. —Back on the sheet layer "back" viewport, I placed all annotations for the section drawing there, in its annotation space. Same for the sheet layer section viewport and sheet player top/plan viewport. —I exported the sheet layer as a DWG. —When importing the DWG back into Vectorworks as a test, both sections come in pretty much the same, whether the sheet layer section viewport or the "back" viewport from a design layer viewport. —The section plane geometry is a scaled block, uncropped. —Annotations as well as the geometry beyond the section plane are 1:1 objects (hence out of scale) on the sheet layer itself. This is really not a usable outcome for my DWG recipient, and seems to be different in some respects from what you describe. Do I need to abandon sheet layers altogether to get the workflow I want? I need to figure this out by September 20th or so, and can share files with you offlist. Yes, please, send the files off list, so that I can look at them. I'm attaching a 2018 VWX file with a typical sheet layer we want to export. Again, we'd prefer for section viewports to export as flattened 2D geometry in model space with annotated, cropped paper-space viewports (like plan viewports do). 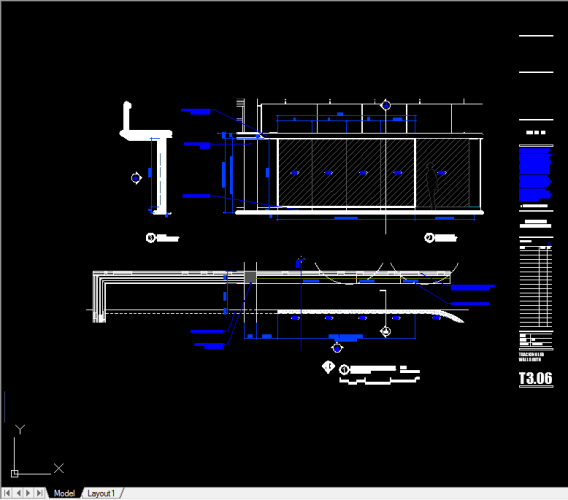 As you can see, Exporting DWG from Vectorworks and reimporting the DWGs into a blank Vectorworks file imports section viewports as scaled, uncropped symbols. PS I do not have your email address so am using private messaging on the forum. If you prefer email, find me at francois@levykohlhaas.com. Thank you for the file. I suppose, that it is the one, which you used when you firstly wrote to me. When this file is exported with the default settings, for section viewports in the sheet layer you will receive corresponding clipped blocks with geometry in the AutoCAD's Paper space layout. It will look exactly as expected - with the appropriate clipping. With the default settings, we do not write any graphics in the Model space for the sheet layer section viewports. You should not re-import the exported DWG to check the exported graphics - as I wrote in my post, we are not able to crop our graphics in a sheet layer without creation of viewports - DLVPs are not allowed in the sheet layers. If you want the graphics to be exported in the Model space, you could use "Export Viewports as 2D graphics in Model space" export option. This of course will not create the corresponding viewports in the Paper space layout. If you re-import this DWG in Vectorworks, you will receive the graphics properly cropped because we will create the necessary DLVPs. From your second post I understood, that you have created cropped Design Layer Section viewports. If you export from a design layer, you will receive a DWG with clipped blocks. Then, re-importing them back you will receive properly cropped graphics because the necessary DLVPs will be created. This is what I meant in my post. If you create sheet layer viewports presenting the cropped design layer section viewports and export with the default settings, we will create blocks to place there the necessary graphics for the sheet layer viewports (for visibility control) and clipped blocks, presenting the design layer section viewports will be actually inside these blocks. 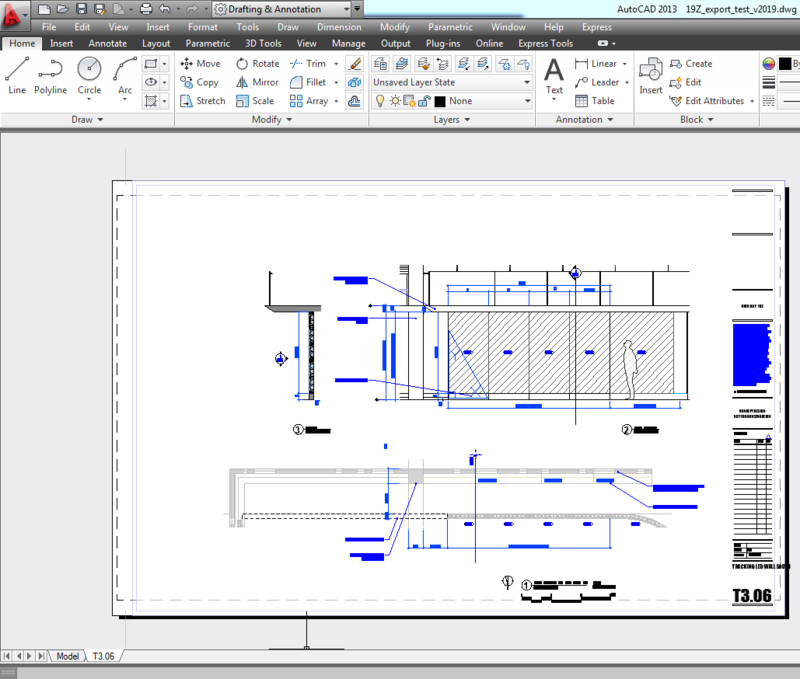 The graphics will look as expected in AutoCAD - you will have both the model space graphics and the paper space presentation - which as I understood is what you want. Again, re-import is not a good check for the exported DWG. On re-import we will not be able to create the necessary DLVPs because we do not support DLVPs inside symbols. That is probably why you have not been able to see what I explained in my post. Regarding the annotations: you have added annotations in the sheet layer viewports, correct? On export to DWG we will place all them as additional graphics over the created viewport. DWG viewports do not have a spacial "space" to put the annotations as we have in Vectorworks. That is way they will be re-imported as separate objects over the created VW viewport. Please, let me know if there is something unclear.